Mayor and Council accepted offer from Mary + Martha/Welcome Hospitality. Preliminary Survey replaced with Record of Survey drawings under "Due Diligence" section. Offering Memorandum Section 5, "Selection," updated and expanded. Section added under "Overview" Section, "Mayor & Council Direction Regarding Sale of Broadway Volvo" (February 21, 2018). Wording has been added to the Offering Memorandum section 16 explaining the submittal need only be one hard copy but bidders should be prepared to provide a digital copy if requested at a later date. Opportunity Zone - reference added under "Overview" and website link added to "Links." 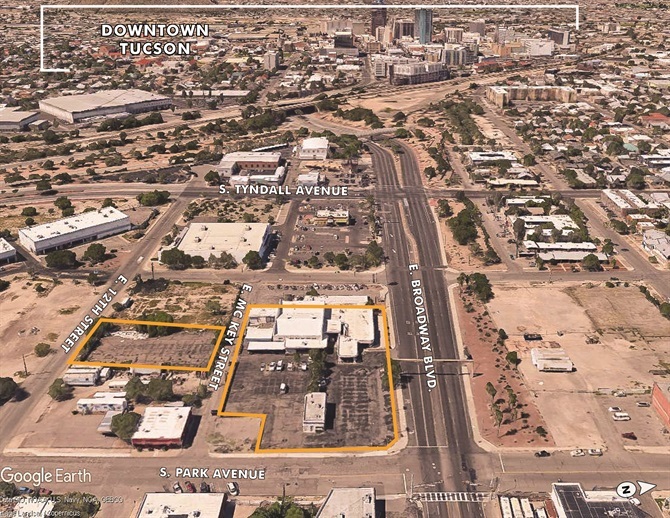 At the direction of the City of Tucson, Arizona ("City"), CBRE, Inc. is hereby inviting offers to purchase 930-948 E Broadway Boulevard & 935 E 12th Street. 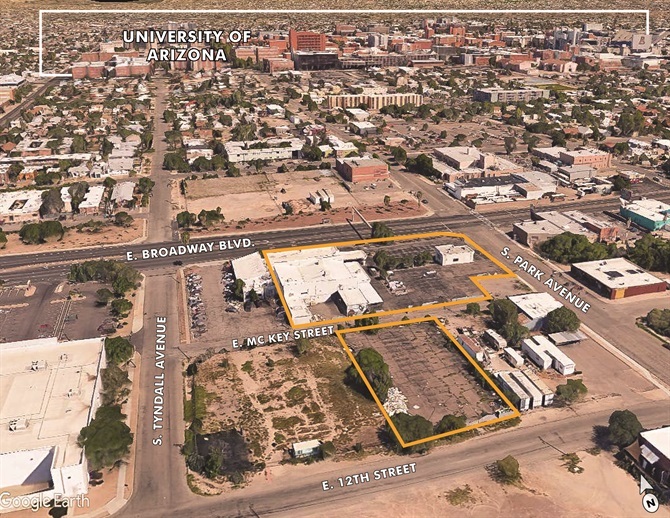 The site is essentially flat, totaling +/- 1.86 acres (per Assessor) at the southwest corner of Broadway Boulevard and Park Avenue (collectively, the “Property”). The Property was formerly a Volvo dealership. It is expected the winning bidder will join with the City to complete a Planned Area Development rezoning currently underway, prior to close of escrow. Information on the Property may be found under the tabs at the top of this page. Instructions on how to submit an offer and the forms to do so (in fillable PDF format) are under the Offering Documents tab. At the current time, McKey Street separates 218A and 2170 from the other parcels. However, the winning bidder may request a vacation and sale of the right of way to create a single contiguous parcel of +/- 2.0 acres. The City will deliver the Property with vacant possession at close of escrow. Improvements consist of a former single story car dealership with showroom, sales office, repair facilities and ancillary storage areas totaling +/- 19,000 sf. The buildings are of varying age, the oldest (948 E Broadway) was built in 1945 and the rest were constructed in the 1960’s, ‘70’s and 80’s. The City expects the Property to be redeveloped. The primary USPS address is 930 E Broadway Boulevard, Tucson, AZ 85719. Arroyo Chico runs through a concrete culvert system beneath the front portion of the Property, identified on the Survey to be found under the Due Diligence tab at the website. The 5 assessor parcels that constitute the main parcel fronting Broadway are in the Rio Nuevo Tax Increment Financing District. 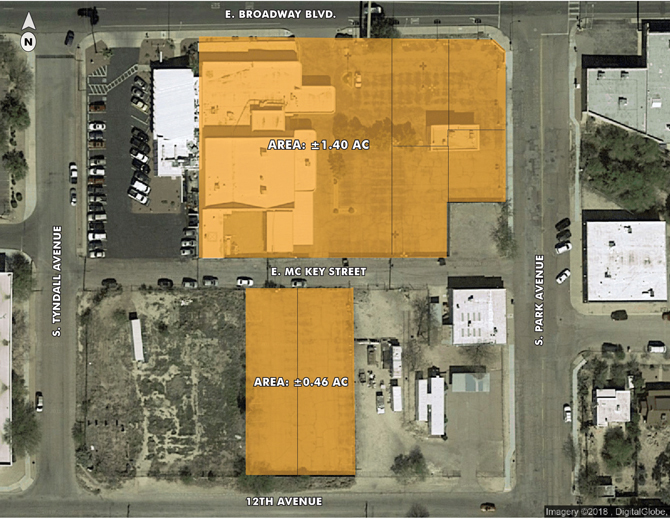 The entire Property is within the City of Tucson Government Property Lease Excise Tax (GPLET) Incentive Area. 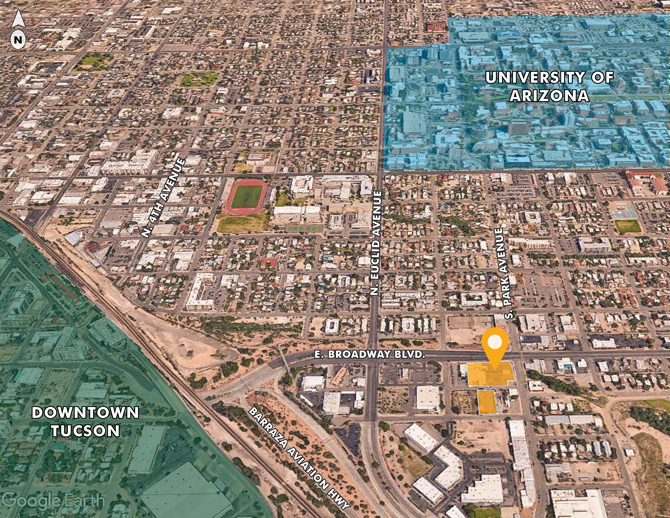 The Property is also within one of the designated areas in Arizona that qualify for the federal Opportunity Zone program (a link to information from the Arizona Commerce Authority may be found under the Links tab). At this time, none of the Property is expected to be needed or taken for the proposed Broadway Improvement project. It was MOVED by Council Member Fimbres, duly seconded, to direct the City Manager to proceed as discussed in Executive Session, and prepare a solicitation that invites proposals for the purchase and redevelopment of the property. That solicitation will require that proposals satisfy certain conditions, including a minimum purchase price based on appraised value, as well as to include conditions relating to future redevelopment that track the goals that have been identified through the public process that has already occurred, including the feedback from the Barrio San Antonio and Miles neighborhoods and the 2014 charrettes that were conducted. The conditions will include prohibition of incompatible uses, such as high-density student housing, convenience store with gasoline sales, large retail establishments, billboards, and auto repair. The solicitation will advise the proponents that purchase price will be a factor in the evaluation, but the award will be based upon the proposal’s overall benefits to the City, and compatibility with the goals as stated. Those goals would include transit-oriented, or mixed-use development; development that is aesthetically compatible and in scale with surrounding development and neighborhoods; ongoing coordination with the neighborhood liaisons, including Barrio San Antonio and Miles neighborhoods; how the proposal will deal with neighborhood concerns over property maintenance, excessive noise, construction activity, and other public nuisances; how the proposal will provide street-level amenities, and encourage pedestrian activity; and identifying parking strategies that encourage shared-parking in existing or new parking lots or structures at or near the site. Michael Rankin, City Attorney, confirmed that, pursuant to the direction from Mayor and Council, the solicitation would factor in all input received to date as part of the public process, and would advise the proponents that zoning would be accomplished through a Planned Area Development (PAD) subject to Mayor and Council approval and any conditions in the PAD. He said he expected that any proposal would make closing on the purchase of the property contingent on the finalization of the rezoning. The motion was CARRIED by a voice vote of 7 to 0. Price – the minimum offer price for consideration shall be the appraised value of the Property. Qualifications of bidder, including relevant experience and financial wherewithal to undertake the re-development of the Property. Preference will be given for transit oriented or mixed-use development. Aesthetically compatible design is desired, in scale with the surrounding development and neighborhoods. Willingness of bidder to coordinate with Neighborhood Liaisons of the adjacent registered neighborhoods, Barrio San Antonio and Miles. Demonstration of willingness to address neighborhood concerns regarding property maintenance, excessive noise, construction activity and other potential public nuisances. Demonstration of commitment to ongoing, active coordination with Neighborhood Liaisons, including Barrio San Antonio and Miles neighborhoods, throughout the rezoning process and subsequent redevelopment of the Property. Use of parking strategies that encourage shared parking in existing and new parking lots or structures at or near the Property.